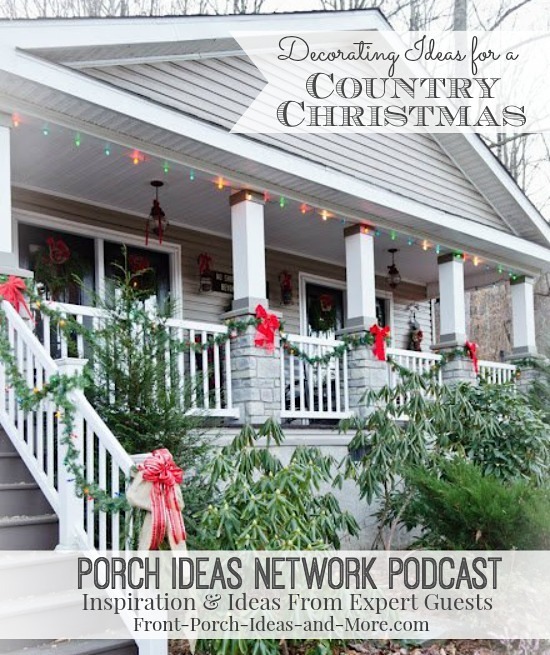 In this episode, Anita Diaz shares her country Christmas home with us. As author and creator of the wonderful blog, Far Above Rubies, Anita's decorating ideas have been featured in numerous magazines such as Country Woman, Romantic Homes, Southern Holiday Life and Ideal Home. If you have ever seen photos of Anita's home, inside or out, you will know exactly why publishers wish to feature her. Anita Diaz lives in beautiful Balsam NC right near the Blue Ridge Parkway and the Smoky Mountain National Park where she grew up. The property has been in her family for five generations. 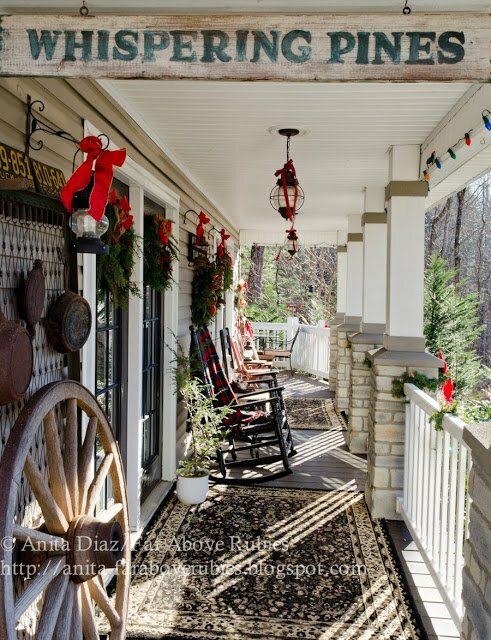 After serving their country in the United States Air Force, Anita and her husband Luis moved back to the mountains of North Carolina where they are raising their family in a lovely country home with beautiful porches! Anita is not only a wonderful home decorator and seamstress, but also a Worship Leader and singer in her church and community. She is most certainly gifted. Dave and I love the sign that hangs on Anita's country porch "Whispering Pines". Her grandfather left this on the property and now it hangs proudly on her porch. It is perfect if you ask us. 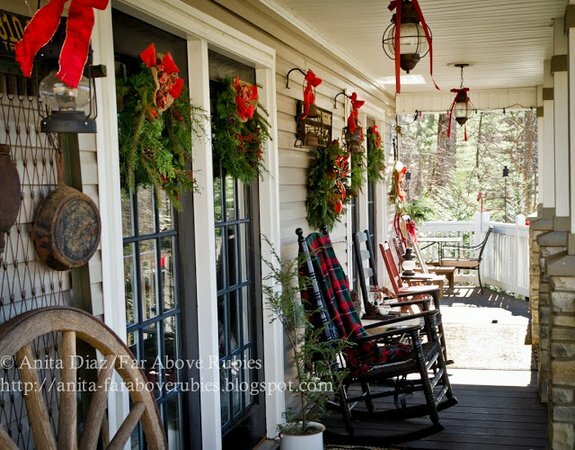 Anita drapes garland and beautiful red bows on her porch railings and porch steps. Notice the lovely colored lights, too. Country Theme: "I have a sled that my grandfather made that I use as a focal point, and the rocking chairs, mason jars with candles in them, anything that looks country and vintage." Lights "Look at the colored lights...that's how it was when I was a child. Everybody used colored lights. So for the last several years I've used those big colored lights and love the way they look. It says Christmas to me and reminds me of being a child." "
Garlands: "For the garlands I drape around, I bought the cheapest, most unattractive garland you can buy. I can't use real garland outside because they won't last. 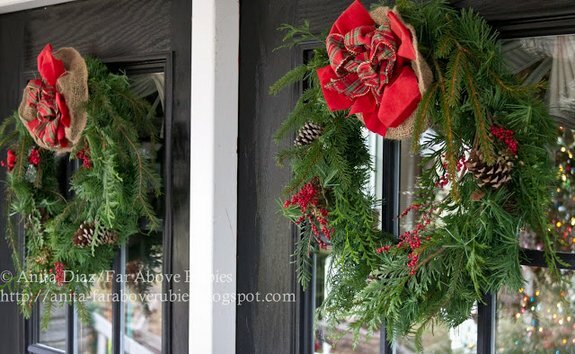 I fluff them and make them look nice and put red bows on them and use pine to insert into the wreaths and garland to make them look really nice. I take out [the fresh greenery] at the end of the season before putting it away for next year." 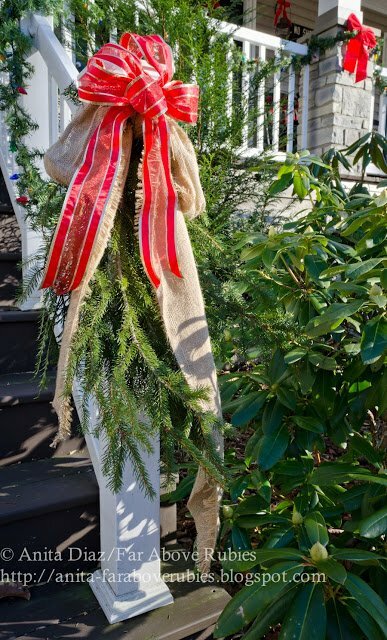 Christmas Vignettes: "...I'll take a basket like that and fill it up with greenery and I have a poncho of my grandmother's, a red, plaid, wool poncho, and I will just drape it over the basket and perhaps put a candle there; they are things that mean something to me." 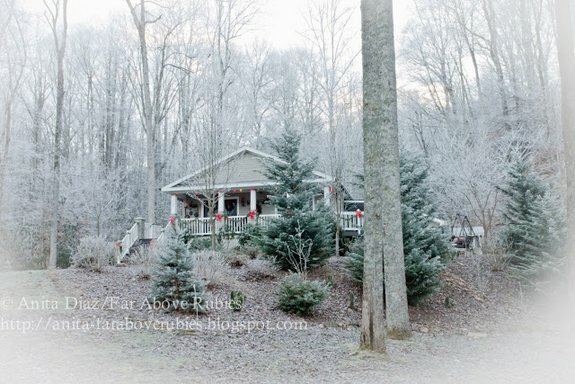 A beautiful country home in lovely Balsam NC, Anita and her husband Luis have made this a most enchanting home for their family. 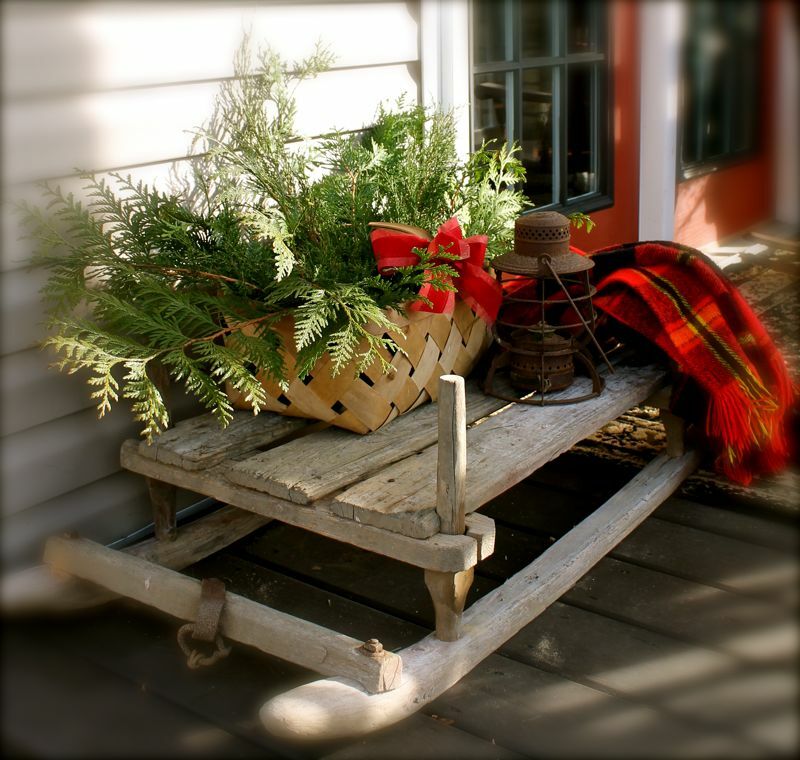 Anita's Christmas porch often includes this vintage sled that belonged to her grandfather and the poncho that belonged to her grandmother. 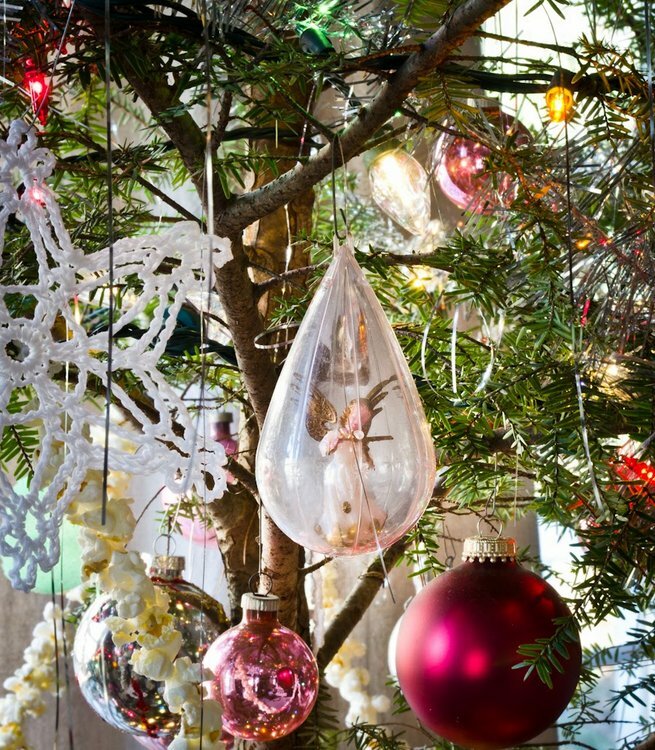 Using treasures that you love and have been handed down to you makes for a more meaningful Christmas and wonderful memories. 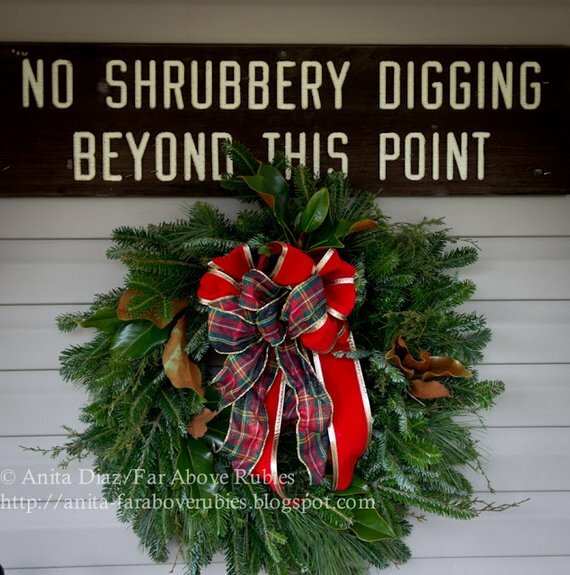 One of Anita's tips is to add fresh greenery (of various types) to faux wreaths. 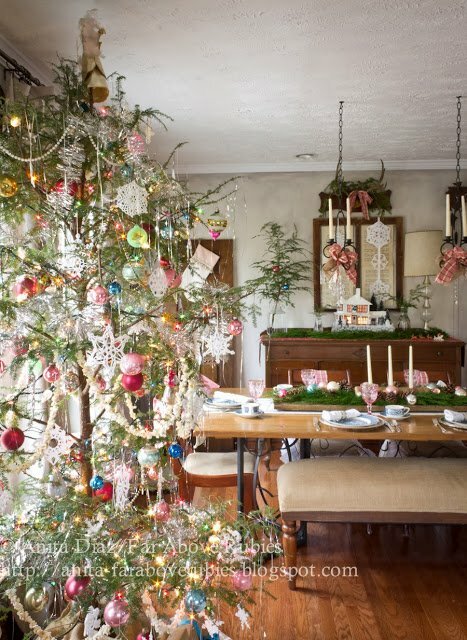 Here you can see how beautiful it looks with delightfully hand-tied bows, sprigs of holly and pinecones. We love her double front doors. 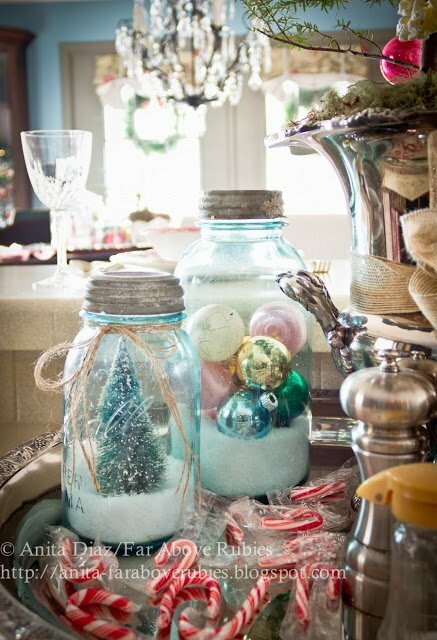 Anita shows how you can create a vintage vignette using mason jars, some snow and lovely old-fashioned ornaments and bottle brush trees. What a magical scene that would work perfect on your porch, too. 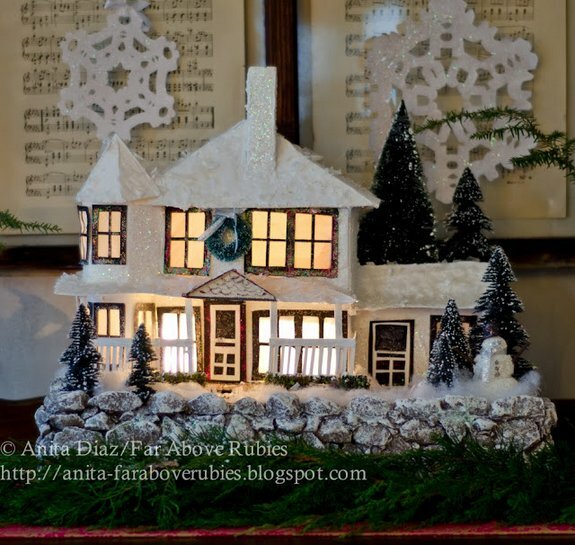 Anita lovingly created this putz house which is a replica of the old house that belonged to her grandparents. What a wonderful way of preserving their legend. 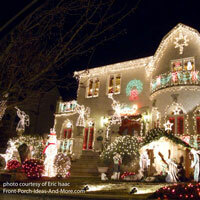 This putz house is made of cardboard, tissue paper, Christmas lights, a rock wall, a screen door and even a snowman. Glitter, too, of course! 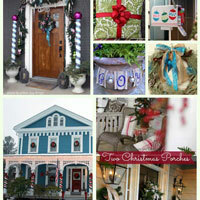 You can just see all the whimsical country touches that Anita adds to make for a truly memorable country Christmas. We love the tree. It's totally natural and whimsical with its vintage-inspired elements. As Anita says, "It's authentic!"